Tennis Theme Address Plaque - - custom made tennis racket shape sign for any tennis player's home or private tennis court. And perfectly shaped commercial signage for a tennis related business. Made in America. Made from sturdy and UV-stabilized, non rusting, laminated acrylic plastic with engraved printing. Personalized with your choice of colors and up to three (3) 2.5" characters. Note: the style number (CSTEN1205) visible above the grip on the tennis racket sign sample is for internal use only and is not on your custom sign. Two 3/16" diameter fastener holes and stainless mounting screws. Dimensions: 12"W x 5"H x 1/8". 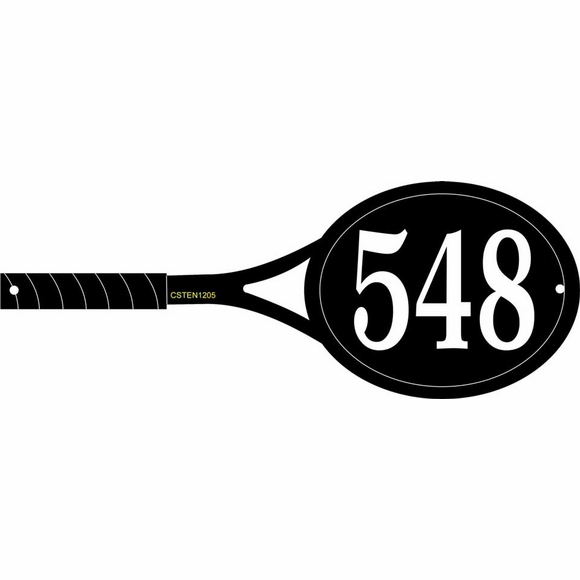 Tennis racket shape address sign for a tennis player's house or commercial signage for any tennis related business. Made in USA exclusively for Comfort House. Not big enough? Not small enough? Need more lines? Need more character spaces? Comfort House can supply a Tennis Racket Shape sign per your requirements. Please contact customer service with your specifications for a quotation (customerservice@comforthouse.com).